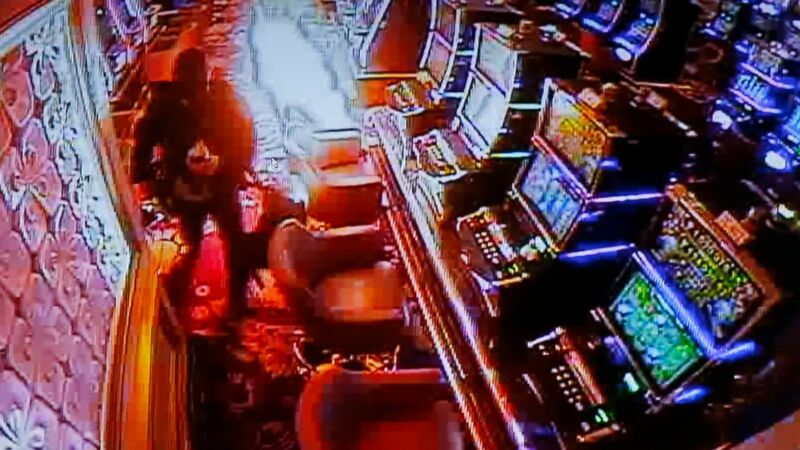 New video footage released Saturday by Philippines authorities from Resorts World Manila shows the gunman in Thursday's deadly attack firing his M4 rifle in the air, setting fire to the casino, stealing gambling chips, and shooting at security forces in a stairwell, police officials said. While local Philippine officials continue to investigate the attack that killed at least 36, newly released video indicates that the gunman may have acted alone, according to police. Manila police chief Oscar Albayalde said the security footage of the suspect in the attack indicated a clear motive, as the gunman headed straight for a storage room in the back of the casino that contained poker chips. (Bullit Marquez/AP Photo) Police authorities and Resorts World Manila complex security play a CCTV video of the gunman setting fire inside a casino during a news conference, June 3, 2017, in Pasay city, southeast of Manila, Philippines. The suspect, who has not been identified by police, was found dead after he set himself on fire, according to police. On Saturday, police said they are questioning a taxi driver who may have details about the suspect. In an ISIS claim of responsibility for the attack, the suspect is described as an "inghimasi," a terrorist whose motive is to penetrate a place, shoot people and then blow himself up. However, Philippine National Police Chief Ronald dela Rosa previously denied reports that the incident is linked to ISIS. In a White House press conference Thursday afternoon, President Trump countered Philippine officials and called the incident a "terror attack" saying, "We're closely monitoring the situation and I will continue to give updates if anything happens during this period of time but it is really very sad as to what's going on throughout the world with terror. Our thoughts and our prayers are with all of those affected." The U.S. Department of State offered its condolences to the victims and families who were affected by the attack. "In the face of this tragedy, the United States proudly stands with the people of the Philippines and will continue to support efforts to achieve peace, security, and prosperity for their country," State Department spokeswoman Heather Nauert said.